Hello Everybody! It's Halloween!!! 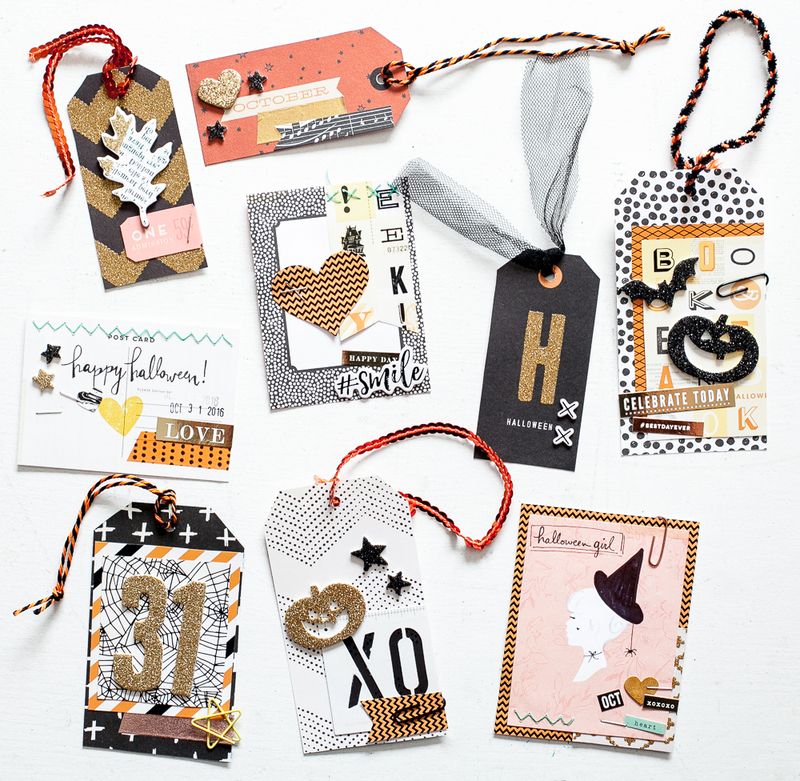 And today I want to share with you some spooktacular tags I made using a combination of adorable Crate Paper collections... Namely, Gather by Maggie Holmes, Cool Kid, and After Dark! I had so much fun making these tags! As you can see, the three collections really work well together! I used the cut apart tag sheet from After Dark for some of my tag bases. For other tags, I used patterned paper that I cut into tag shapes or journaling cards that I got from the Gather ephemera pack and the cut apart sheet. I love the little tag I made using one of the cute journal cards from Gather, that has the little girl's silhouette on it. I added a little witches hat to the girl and doodled in some details like her eyelash, a heart beauty mark and a little spider hanging from her hat. I think the stitching that I added to several of the tags...like the postcard one....really adds a nice finishing touch and makes everything feel a little more "handmade from the heart". For several of the tags I added some extra pop and glamour by using gold metallic washi from Gather and also good and black glitter stickers from After Dark. As you can see, I added some little paperclips to some of the tags too. I love paperclips, they just finish the look of scrappy projects so perfectly! I used a few simple paperclips, but also a really special yellow star decorative paperclips from the Cool Kid collection. I hope you like my spooky, fun tags and that I have inspired you to make some of your own this Halloween! They certainly are great to give out to friends and fam in their trick-or-treat bags, to put in a mini album documenting the month of October, or to hang up as decoration on a banner or a Halloween tree!